Picture Puzzles are one of my favorite puzzle type. These are the puzzles in which you require only your observational skills. No knowledge of any kind is required to solve these kind of puzzles. 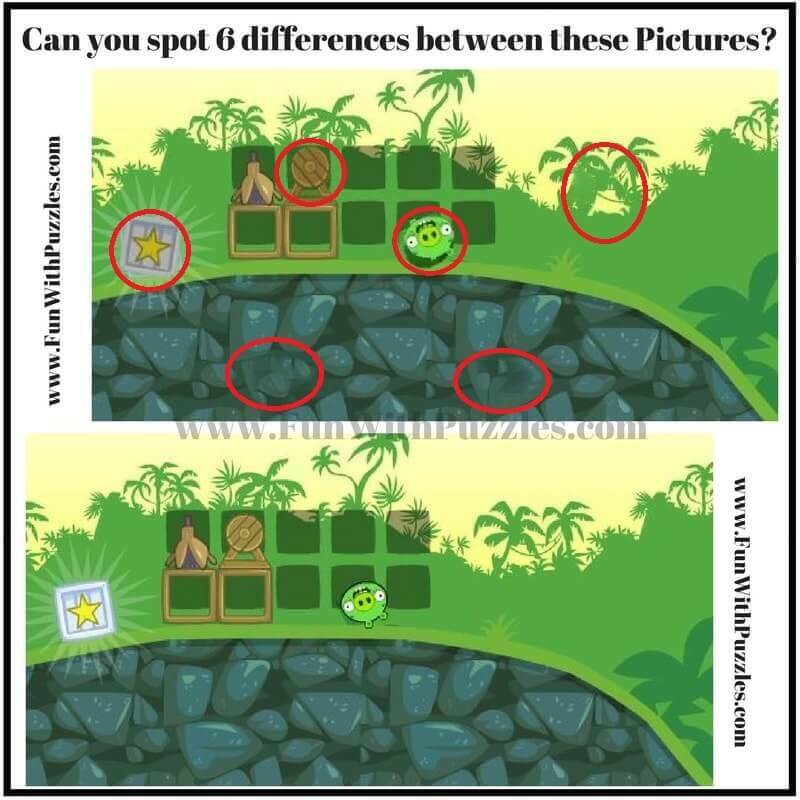 One of very famous Picture Puzzle type is "Spot the Difference" puzzles, in which one has to find the differences between two given picture images. Earlier I had published tutorial on How to Solve Spot the Difference Picture Puzzles. Today's Picture Puzzle is Spot The Difference Puzzle. However technique mentioned the tutorial is not going to work on this puzzle as I have shifted the plan of both the photographs so that these pictures can not be overlapped. Today's Puzzle Photograph is taken from famous game "Angry Birds and Bad Pigs". In this Spot the Difference Picture Puzzle, two similar looking pictures are given. There are six differences between these two pictures. Can you spot all these six differences between these pictures? Can you spot 6 differences between these pictures? 1. Finding Hidden Faces in the Given Pictures Brain Teasers: This is one of the most like Picture Puzzles on this website where your challenge is find the hidden faces in the given picture puzzle images. 2. Picture Puzzles for Teens With Answers: It contains different types of Picture Puzzles. Do go through these puzzles to explore different Picture Puzzle types on this website. 3. How to Create Magic Images to Disillusion your mind: You can also create the Magic Picture Images which will disillusion your mind. Do learn about creating such Magic Images. 4. Missing Piece Picture Puzzle: This is another kind of picture puzzle in which your challenge is find the missing piece from the Puzzle Picture Image from the four different given choices.